When it comes to choosing your next vacation, there are fewer places better than New Zealand, what with its natural beauty, diverse landscapes, and many, many things to do during your likely too brief a stay. It’s a bit of a cliché for travelers to step off a plane and declare the air of a new country to be delicious, but if there’s any truth to that truism anywhere, it is for New Zealand, especially when it’s summer in the U.S. but winter down there. If you think the birthplace of Manuka honey might be the right destination for you, then we might suggest visiting Queenstown, which is a prime spot on New Zealand’s South Island for outdoor adventuring, by way of the North Island city of Auckland. 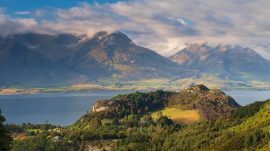 While it might seem an unfortunate circumstance, Queenstown has no international flights, but this is good, as you’ll get to enjoy two New Zealand cities as opposed to one. When booking your travel, try arranging it so you can spend the last of your vacation in Auckland. This way your longer arm of travel is complete, as your flight home will likely be harder with your job and other responsibilities just around the corner. Once you hit the Queenstown tarmac, the Remarkables mountain range will be the first thing you see, and that’ll be your time to breathe in the Kiwi air in all its delicious glory. What Can I Do While There? For those who consider themselves thrill-seekers, Queenstown is the right place for you, with everything you could want set against dramatic mountain peaks and luminous turquoise rapids. However, there’s a little something for everyone and not just those looking to skydive or bungee jump. Try a trip to the gondola, which offers views that go on for miles and a place for a drink up top. Once you’re used to the heights, you can try bungee jumping, white water rafting, snowboarding, skiing, or just a stroll through Queenstown’s gardens where disc golf has grown popular. You can also charter a helicopter if you want to avoid getting wet. Unfortunately, drip coffee isn’t a thing in New Zealand, which means you’ll want to get used to Americanos fast. The upside is that espresso down there is both tasty and strong, with milk being extra creamy. Once appropriately buzzed, you might want to try out the Lodge Bar with its perfect perch for sunset watching. If you’re craving a snack while there, order some savory, sweet topped toast—the sourdough is baked in house with water out of Lake Wakatipu. If you want a more substantial meal, check out Gunner’s Game Pie for the venison and rabbit or the braised, buttery beef cheek. Of course, your trip to Queenstown wouldn’t be complete without a taste of the area’s local wine, and you could make it a real event by reserving a table in Amisfield Winery’s Bistro and Cellar Door, which is a mere 20-30-minute drive past downtown. The beautiful schist stone tasting bar and restaurant with a central fireplace makes for one comfy site to get quite buzzed on Otago’s Pinots. Also, make sure to get a sizable glass of Pinot Blanc, a wine made in small quantities that are only sold at that location. If you are unable to get New Zealand, you can still enjoy one of its best imports… Manuka honey! To get your orders started, click here, and remember, we offer FREE shipping on all orders of $150 or more.